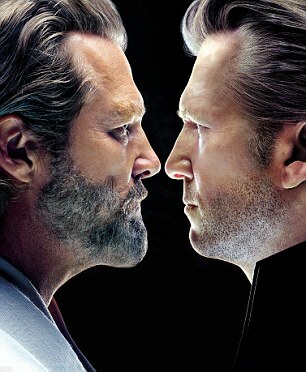 Jeff Bridges is the first actor to play opposite a younger synthespian version of himself, which he does in Tron: Legacy, the upcoming blockbuster from Disney. As those of us who saw the original recall, Bridges played video-game mogul Kevin Flynn. Thirty years later, he faces a digital version of himself in his thirties. New technology enabled film-makers to record the star’s facial movements in minute detail and then superimpose them onto a digital model of his younger self. For Bridges, the development marks a new epoch in cinema. ‘Whenever I see a big, epic film where the character has aged from being a boy to an old man, traditionally there are different actors playing him and there’s always a little bump for me when they change from one actor to the next. But now I can play someone at any age. It’s the beginning of a new era of film-making. 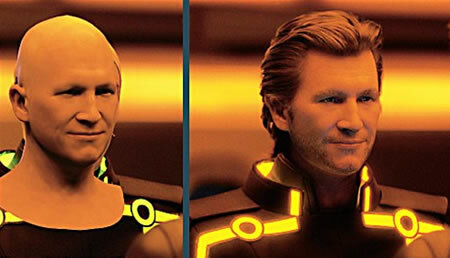 I'm sure that the irony of Jeff Bridges being scanned into the movie Tron: Legacy in a manner similar to his character Kevin Flynn being scanned into the video game Tron in the original movie Tron will not be lost on Technovelgy readers. "What did Blackwell mean, last night, about Rez wanting to marry a Japanese girl who isn't real?" "Idoru," Yamazaki said... "'Idol-singer.' She is Rei Toei. She is a personality-construct, a congeries of software agents, the creation of information-designers. She is akin to what I believe they call a 'synthespian,' in Hollywood." The first entirely digital actor was created by Jeff Kleiser and Diana Walczak for their 1988 short film Nestor Sextone for President. See a brief video of this historic creation here. 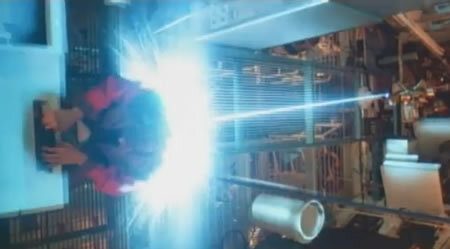 Theater audiences were treated to an advanced version of synthespians in Avatar (see my earlier article James Cameron's Avatar Synthespians). Via an excellent article in the Daily Mail.